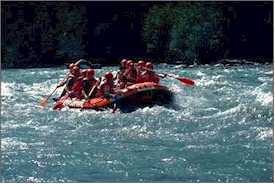 ABOVE: Thrill-seeking tourists navigate swirling rapids in the Swiss Alps. Offering thrills to tourists is nothing new in Interlaken and the surrounding Jungfrau District of the Bernese Oberland, where intrepid visitors have been entertained with mountain-climbing, alpine touring, and other challenging pursuits for more than a century. Today, adventure travel has become an offshoot of mass tourism, with many activities that are geared toward weekend thrill-seekers. Interlaken's tourist industry is meeting the demand for quick (if not especially cheap) thrills with paragliding, skydiving, bungee jumping, canyoning, kayaking, and other pursuits--including white-water rafting, which is open to any adult or older adolescent who's in good health, has a strong stomach, and can afford 85 to 100 francs for a morning or afternoon's excitement. Excursions take place on several rivers in the vicinity, and you can match your itinerary to the degree of risk and excitement that float your boat. Warning: White-water rafting and other commercially packaged adventures aren't without danger. In 1999, a flash flood killed 19 tourists who were "canyoning" in a gorge near Interlaken. Adventure World, the Interlaken firm that organized the trip, ceased operations in May, 2000 after a bungee-jumping fatality in nearby Lauterbrunnen. Choose from four rivers, with excursions ranging from "the ultimate adventure" to "a relaxed and sociable float." Alpinraft also has canyoning (sliding down "natural waterslides" in wet suits), bungee jumping, horse trekking, and other adventure activities. A multi-page guide to the tourist center of the Jungfrau district.